Claude Monet, "The Grand Canal, Venice"
"The Grand Canal, Venice", Claude Monet 1908, oil on canvas 73 x 92 cm, Fine Arts Museums, San Francisco California USA. 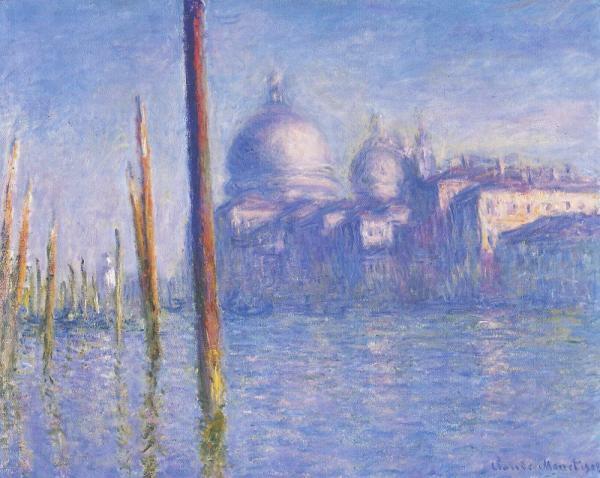 Monet made a trip to Venice in Fall 1908. During his two monthes stay, he painted 36 views of the city. In this first painting, Monet was working at water level. The church of Santa Maria della Salute is illuminated by the afternoon sun. On the left, the poles used for mooring gondolas.